My desk is actually much larger than what is shown in the picture. 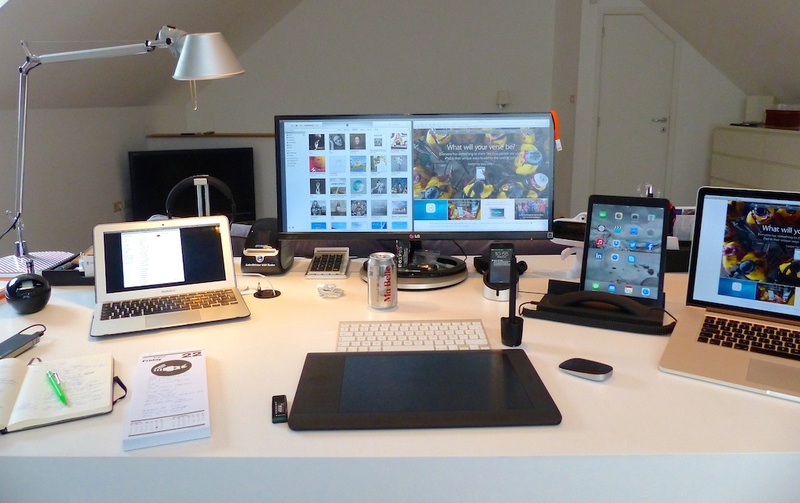 I use my workstation as the Managing Director for a Creative, Production, and Consultancy Services firm. What are some apps that are essential to your workflow? Do you have a Mac setup you want to share with OSXDaily? Go here to get started by taking a few high quality pictures of your desk or workstation, answering some questions about the hardware and usage, and email it on in! Don’t forget to check out our past Mac setup features too! I like these real desk shots, with the open notebook, scribbles around papers, Coke can and all, it’s a snapshot into a real functioning workstation rather than a manicured desk that has obviously been cleaned up or gets not use. The apps used section is blank though… looks like hit “Publish” too early? I usually love these Mac setup posts but this one feels like it’s incomplete, what’s up with that? I don’t write for this site. this article should be called “how much Apple products could one person cram into one desk photo.